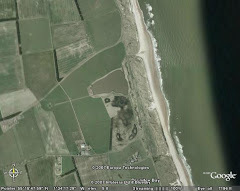 Druridge Diary: Christmas presents don't get better than this - A FULL PATCH TICK! Christmas presents don't get better than this - A FULL PATCH TICK! Christmas comes but once a year.Nowadays patch ticks don't come much more frequently. We had our traditional Christmas Day walk at Druridge this morning,the first bird was a barn owl hunting by the road - a year tick. The other highlights were an ermine stoat, it's aeons since I last saw a winter stoat - this one still had some brown along the ridge of its back, otherwise white, and a merlin. As the road between Cresswell Village and Cresswell Pond is now pretty much impassable, we headed home via Widdrington and thank god we did! Just as we rounded the double bends, I spotted a bird crouched by the roadside. Bins on it, it was a partridge, but not a grey partridge, common at Druridge, especially lately - this one was a red-legged partridge! Then there were two, then three, then a whole covey of at least 18 birds! Amazing! What better Christmas present could a patch worker want than a full patch tick? It has to be said though, only a patch watcher could get excited about seeing red-legged partridges! 20 RLP have been just west of widdrington for nearly two years. One pair ventured into the farm last spring and one (presumably the male) displayed each morning on a dung heap. Ive lost all the Partridges from my patch - Grey and Red legged, none seen this year at all. Dave, I've seen them down towards Felton Lane before, the snow and cold must've pushed them east. Thanks Warren - hoping the next one might be a bit more spectacular! Stringer, if they get established at Druridge I will soon get sick of seeing them too. Don't know how significant this might be to you; I've just had a Tawny Owl on your patch!